And it’s the end of November! November has flown by, but I think I say the same thing every month! I’ve had a fairly productive month, but also a stressful one. In between Christmas shopping, looking after baby and general household chores, I’ve been ill, the dog has been ill and we’ve been contending with some serious sleep deprivation! I’ve had a busy blogging month this month. I decided at the start of November that I was going to do ‘Blogmas’ this year and I made it my mission to plan and write as many of my posts for it before 1st December, as well as keeping to my usual three posts a week throughout November. I’m pleased to say that 22 posts are ready to go live starting tomorrow! This month I also had my most successful blog post. My ‘So! I’m an Unmarried Mum‘ post has become my most popular post to date and hit my highest page view figure in less than a week of being published. I’m thrilled about this as I was so passionate about this post. I’d been thinking about writing it for a while and then I had an urge to just do it. So, I popped little one in her activity gym and typed away – I don’t think I’ve ever typed as fast as I did when writing that post. I’ve also been joining as many linkies are I can. They’re a great way to bring traffic to your blog and discover some great blogs and content from other bloggers at the same time. Linkies are a great little community and if you find the ones that work for you, you’ll reap the benefits. Little miss hit a big milestone this month – she can now officially crawl! I’m excited and concerned by this all at the same time! I’m so glad she can finally crawl as she’s been trying for months and has been getting so frustrated with herself, but I’m also worried about the Christmas tree I’m about to put up! She’s only 6 months, so she’s a little earlier at crawling than to be expected, but now she’s doing it, there’s no stopping her! You may have noticed that I’ve stopped with the weekly weaning posts. As little one is mainly eating the same foods on a rotational basis with a few new things thrown in here and there (chopped Italian tomatoes and courgette, bananas and the juice of satsumas) there really wasn’t anything exciting to post about with her weaning progress. I’ve also only recently realised that when we started her weaning was the same time that she stopped sleeping so well and over recent weeks she’s been struggling a lot with wind, so we’re taking it easy at the moment. I was so thrilled to have been nominated for the Liebster award by one of my fellow bloggers. You can read all about it here and also find out who I nominated. 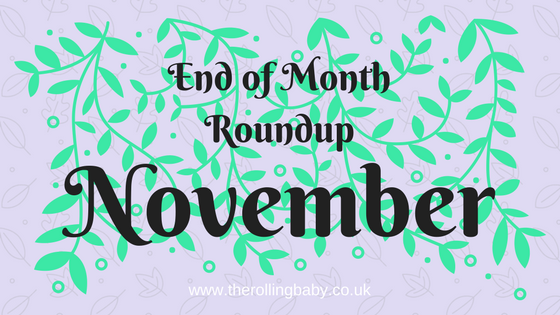 I can’t quite believe that by the time I write my next end of the month roundup, Christmas will have been and gone and we’ll be about to enter 2018. Time really has flown this year, especially since little one’s arrival.